Home › Christmas › What About the Christmas Star? What About the Christmas Star? We put star ornaments on our Christmas trees and see countless representations of this iconic symbol throughout the Christmas season. We’ve heard many theories about it and might admit a tinge of excitement when scientists confer on theories of aligning planets or astronomical occurrences that perhaps could be tied to the timeline of the historic event of Jesus’ birth. Let’s look at what the Bible actually says about the Christmas star, then what astronomers have said about it, and then what Christian commentators have suggested over time. You can then make your own conclusion on the topic after getting updated facts and information on something that’s certainly more than folklore. 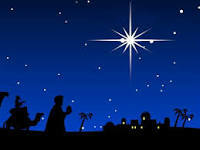 If you read the entire passage there is no doubt the star is a critical element of the Christmas story. It is the guiding light for the Magi. There have always been rational men that have tried to explain the Christmas star as a natural event. In his article The Star of Bethlehem*, T. Michael Davis highlights various scientists, including Johannes Kepler, the 17th century astronomer who believed that the star could have been a supernova (an exploding, changing or dying star that grows in brightness and so appears to be a newly formed star). However, a supernova and/or nova (a temporary brightening of an existing star) are both stars in fixed positions that rotate daily east to west from earth’s perspective like normal stars. Additionally, Davis points out explanations by Humphreys and others that involves the occurrence of conjunctions (when two or more planets, in their individual paths across earth’s sky, come into close proximity to each other and appear to merge into a single bright object. In fact, there were conjunctions of Jupiter and Saturn in 7 BC, and of Mars, Jupiter, and Saturn in 6 BC, and Venus and Jupiter that occurred in 2 BC. Hmmm. Well, in any event or natural scenario it’s hard to imagine a “star” settling over any one specific house in Bethlehem. What Do Christian Commentators Say? Say the explanation is supernatural and miraculous but leave it at that. Charles Spurgeon actually declared that questions about the star “are not of much importance to us.” But he also offered the explanation that it “was probably a meteor, or moving light.” But he also called it “a luminous appearance in mid-air” likening it to the light that led Israel through the desert. Indeed, if you study the text of Matthew, particularly verse 9, you have to conclude that the Christmas Star of Bethlehem goes far beyond natural phenomena. It’s appearance and reappearance is supernatural. To apply finite dates and actual astronomical science is fruitless, like trying to find Moses’ burning bush or evidence of the Shekinah glory (God’s cloud by day and pillar of fire by night – Exodus 13:21). Certainly the entire purpose and birth of Christ is all about the supernatural. The God of Israel has long performed the miraculous in revelation by extraordinary episodes (Mount Sinai, the virgin birth of Christ, the heavenly host signing in Bethlehem, Jesus’ baptism at the Jordan, Saul/Paul outside Damascus). I too believe the Christmas Star was just such an event, a direct intersection of heaven and earth through the miraculous power and light of Creator God. Through this supernatural event He led the Magi east to Jerusalem, then south to Bethlehem, then ultimately and directly to the specific home of the revealed child king. No, this was no star in outer space. This was the supernatural moving star-like light on the western horizon then on the southern horizon toward Bethlehem, then the directive spotlight that fulfilled the heralded supernatural birth of the Son of God, Savior of the world. * The Star of Bethlehem, by T. Michael Davis, article in Christian Research Journal, volume 30, number 6, 2007. ** The Star of Bethlehem: The Legacy of the Magi, by Michael R. Molnar (New Brunswick, NJ: Rutgers University Press, 1999), p. 87.